Holocaust survivors in Israel are a very special community of Jewish people who understand the meaning of deliverance in ways that you and I will never be able to comprehend. This group of elderly Jewish people is about 200,000 strong — and by one means or another these brave souls made their way to Israel over the last 68 years. Many of them immigrated to the Holy Land during the last two decades from various parts of the former Soviet Union. These Holocaust survivors are now passing away at the rate of about 30,000 per year, and we cannot wait one more moment to present the Good News of eternal deliverance to these precious people. Your Mission to the Jewish People, Chosen People Ministries, lovingly serves this community of Holocaust survivors in Israel in a variety of ways. We help them with practical concerns: food, clothing, repairing and cleaning their apartments, and much more. We spend time with them—taking them on trips so they can get out of the house, helping them celebrate the Jewish holidays, including Hanukkah, of course! Most of all we try to counter their loneliness by investing our time to sit by their side, to listen to them reminisce, and enjoy wonderful moments of conversation about the deeper matters of life. Of course, in the midst of developing these wonderful relationships, the conversations naturally lead to discussions about God, everlasting life, and ultimate deliverance. I have had many conversations over the years with Holocaust survivors about the ways in which God delivered them from certain death at the hands of the Nazis. Some fled just moments before they were going to be taken away and sent to a concentration camp and, still today, they cannot figure out how their timing was so perfect. Others were about to be shot, and guards were distracted and somehow they ran into the woods and were saved by Gentile families who took them in and hid them from the Nazis. It took several years of investment in their lives before the doors were open to having deeper spiritual conversations and before some of these precious Holocaust survivors began giving their lives to the Lord—but it is happening. Chosen People Ministries’ staff have prayed with over a dozen Holocaust survivors to receive Jesus as their Savior in the land of Israel! It is impossible not to be moved by the stories of these Holocaust survivors! Many of these special people are in process—raised as atheists in Eastern Europe, now in Israel, they are ready to begin seeking and talking about faith and what their future holds! During this wonderful season of the year—all I can really think about is deliverance, redemption and the joy that comes from knowing the One whom to know is life eternal (John 17:3). He is our joy, our hope, our comfort, our message and reason for the delight we take in celebrating this season of the year! So let me say to you, personally: Happy Hanukkah, Merry Christmas, and thank you so much for your prayers and support and for being a part of our Chosen People Ministries family! Without you, we could not be used by God to touch the lives of Holocaust survivors, religious Jewish people in Brooklyn and Jerusalem, and the secular Jewish people in New York City, Los Angeles, Toronto, Chicago, and all across the globe. On behalf of the Chosen People Ministries staff, I want to thank you for standing with us in the great work of reaching His chosen people for the Messiah throughout 2016. We believe the best is yet to come, as Jewish people are becoming more open to the Lord and as we draw closer to that great day when the Jewish people as a nation will turn to the Messiah and embrace Him as Lord. For I do not want you, brethren, to be uninformed of this mystery—so that you will not be wise in your own estimation—that a partial hardening has happened to Israel until the fullness of the Gentiles has come in; and so all Israel will be saved; just as it is written, “The Deliverer will come from Zion, He will remove ungodliness from Jacob.” This is my covenant with them, when I take away their sins. Shalom! 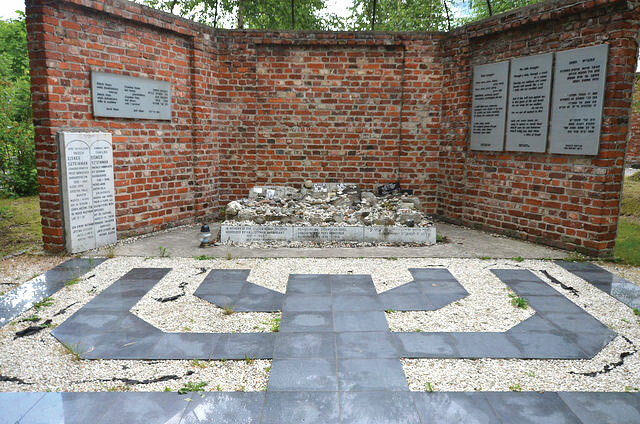 I recently returned from our first Holocaust Memorial Tour which began in New York City, moved to Berlin and finally to Poland, where we also visited Auschwitz. What a powerful reminder of the sinfulness of man and faithfulness of God to His chosen people. During the course of the tour, the Lord brought to my mind a passage of Scripture which I in turn shared with our group of 35-plus participants. From the standpoint of the gospel they are enemies for your sake, but from the standpoint of God’s choice they are beloved for the sake of the fathers; for the gifts and the calling of God are irrevocable (Rom. 11:28-29). These verses are a powerful reminder of His everlasting goodness. I shared with our group that if we see that God is faithful to the Jewish people, then He will be just as faithful to those who know Jesus as Messiah and Lord! So many of the attitudes Jewish people have towards Jesus developed in Poland! The Jewish people were welcomed to Poland by kings around the tenth century and lived a fairly good and protected life there until the mid-1600s. Then, many of those who lived in this area, both Poles and Russians, turned on the Jewish people and brutally persecuted them. 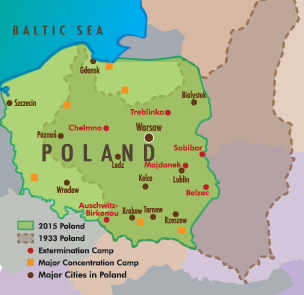 By the late nineteenth century, many Jewish people left Poland for the United States, Canada and other parts of the world. Their hardships in Poland, often made worse by the Church, influenced their understanding of Christianity and these attitudes were passed down. Most of the negativity and sometimes hostility your Jewish friends have towards Christianity was shaped in Poland. But, the Holocaust was undoubtedly the final nail in the coffin of alienating the Jewish people from the Gospel. 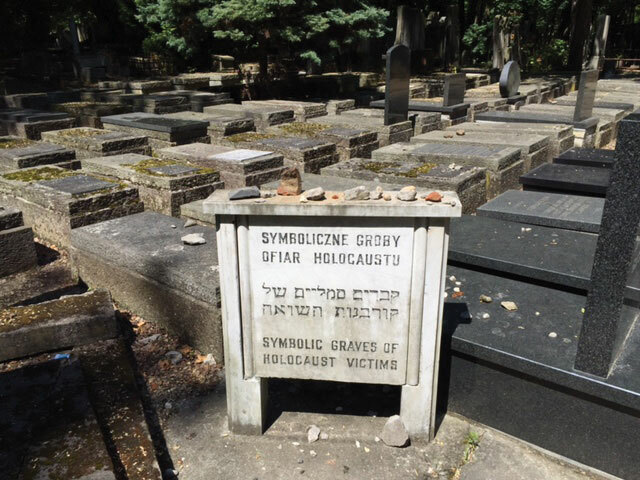 One of our volunteers who works with Chosen People Ministries Poland put it this way—and I think his words will haunt me for the rest of my life, “Poland is filled with places and stories of Jewish life that once were because Poland is actually the largest Jewish cemetery in the world.” His words were chilling! There are less than 10,000 Jewish people living in Poland today—compared to a pre-war population of 3 million. These deeply disturbing facts make the task of Jewish evangelism a complex and difficult undertaking, as you can well understand. So, how is it possible for the Lord to touch the lives of Jewish people raised to believe that Christianity was their enemy? You see, the answer is always love. Jesus was the embodiment of the Father’s heart and love for a sin-damaged humanity. As believers, we are filled with His Spirit, enabled to embody His love to Jewish people who do not yet know the Messiah. I also told one of our tour participants, who was brokenhearted and overcome with grief after visiting Auschwitz, that a candle shines brightest in a dark place, and that Christians can be bright candles of God’s love to the Jewish people. Blessings to you and thank you for praying! I just returned from a quick trip to Israel where I had the opportunity to visit Sderot, an Israeli town which is located about a mile and a half from the Gaza border. This little city of almost 30,000 people has been hit hard over the years by rockets and missiles unleashed by Hamas. The citizens of Sderot are primarily Russian Jews who emigrated during the last couple of decades from the Former Soviet Union. Many are elderly and moved to Israel after the fall of the USSR, as they wanted to live out the rest of the years in a Jewish country. 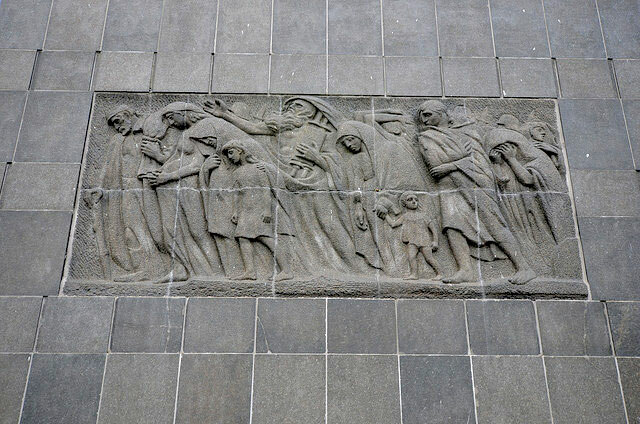 The lives of Jewish people living in the Former Soviet Union were marked by difficulty and discrimination. The move to Israel for many of these Russian Jewish people was an opportunity to finally live someplace where they could no longer be mistreated for their Jewish heritage and to find some peace and security for the rest of their days. However, this has not been the experience of the Russian Jewish immigrants living in Sderot. For more than a decade their lives have been anything but stable. The small town of Sderot is known for having bomb shelters 10 seconds apart because there is so little time between the launching of a rocket and the moment of impact. Over the last number of years, the government of Israel has retrofitted most of the apartment buildings with its “safe rooms.” So as long as these elderly residents remain in their apartments they are safe. However, if they happen to be walking around outside of their homes then they are often in harm’s way, especially during seasons of intensive attack as was just experienced during this past summer. There were days when 30–40 rockets fell on Sderot. During this time, the elderly Russian Holocaust survivors stayed in their apartments isolated for days and weeks on end. During my brief visit I spent quite a bit of time with two Holocausts survivors. One of these elderly ladies left her village in Ukraine for Russia where she was safe from the Nazis throughout the rest of World War II. The other was only five years old when the Jewish people in her village were massacred. She survived and was taken care of by a Gentile woman who raised her. After Perestroika, both women, one in her late 50s and the other in her early 70s, left Ukraine and moved to Israel. Sderot was a good option for them since it was inexpensive and had a strong Russian speaking community. Moving to Israel at an elderly age, these women felt it was better to be around other Russian speakers as they knew it would be very difficult to learn Hebrew. Both of these remarkable women are part of a network of Holocaust survivors in Israel. There are currently fewer than 200,000 survivors and unfortunately tens of thousands of these dear people are passing away each year. Many are poor and living on government assistance, some are receiving repatriation funds from Germany and quite a few – especially if they do not have children living in Israel – are very lonely and in great need of companionship. For so many of us, including myself, they remind me of my grandma and grandpa – my bubbe and zayde (a little Yiddish!). Our ministry has supported these Holocaust survivors by taking them on trips within Israel and to other countries, giving them opportunities to celebrate the Jewish holidays, providing substantial amounts of food staples and much more. It is also understood that it is against Israeli law to try and “persuade” those we are providing with material support of a different religion. We easily abide by these rules as eventually once relationships are built, these precious people ask a lot of questions about our faith in the Messiah and we are free to speak to them – as long as it is not during a time when we are distributing foods or other types of goods to them. Many of the survivors have become moms, dads, grandmas and grandpas for so many on our ministry team. These relationships have become quite close and we have developed a very deep sense of love for one another over the last 10 to 15 years, as we have gotten to know one another. While driving one of these elderly women from Jerusalem to Sderot we had a long conversation in the car about God. This very bright, 90+ year-old woman, who has participated in many of our trips and local events told me that she believes that Jesus is the Messiah in her heart, but is struggling to understand this with her mind. I was a bit stunned by her telling us this since I had not really asked her the question – she took the initiative. We had a great discussion about the meaning of faith and I do hope and pray that she will continue in her pilgrimage. Personally, I believe she is much closer than she thinks! We have invited one of our Israel staff members to come to New York City and join us for a Hanukkah-Christmas Fellowship Banquet on Saturday night December 6 at the beautiful Canoe Studios on the West Side of Manhattan, overlooking the Hudson River. We will be raising funds that evening for the work we are doing to help these elderly Holocaust survivors in Sderot and in other cities in Israel. I could use your help in getting the word out and so please feel free to send the website along to both Christians and Jewish people you believe might want to attend. If you live close by, I hope you will consider attending. This will be an especially wonderful evening as Marty Goetz, a well-known Messianic Jewish recording artist, will be performing his original songs as well as traditional Hanukkah and Christmas music. It is going to be a spectacular evening and I hope that we are able to continue to raise considerable funds to help improve the quality of life, both physically and spiritually, for these Holocaust survivors. Please visit: chosenpeople.com/holidaybanquet for more information.